Washington St. continuing to the left, Harvard St. to the right. Note horse drinking water in front of the store. The Joyce grocery store had originally occupied both sides of the building. Circa 1883, Joyce briefly downsized to the right side only, seen here, and was gone entirely by 1885. 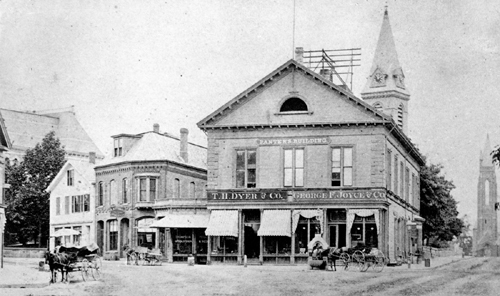 Thomas H. Dyer, grocer, would occupy the left side until 1904; Frank F. Seamens, Groceries, would replace Joyce circa 1885 and also remain until 1904 when the building was replaced by the building that stands today.